The Gawigawen is a six-headed giant that resides in the Phillippines, wielding giant weapons and guards its land rich in fruit in Adasen. In the tale "Gawigawen of Adasen", Aponitolau's wife, Aponibolinayen, wanted some oranges from the Gawigawen, and he set out to get them for her. Ignoring every bad omen put upon him, Aponitolau went to face the Gawigawen, where he delivered his wife her oranges via spear while losing his life. Years later, Aponitolau's son, Kanag, grew up into a strong warrior and set out to fight the Gawigawen to reclaim his father's body. Receiving every good omen available, Kanag faced off the Gawigawen and successfully defeated the Gawigawen, resurrected his father, and together, returned home. In designing the Gawigawen, I once again took a cue from Attack on Titan for a visual style to the Gawigawen, using Levi's Titan form as the basis. 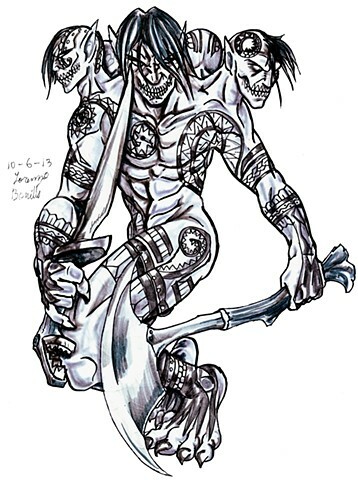 I then arranged the heads to give the Gawigawen a full 360 degree view for combat, while adorning his body in tattoos. I then researched Filipino weapons to arm the Gawigawen and that completes the six-headed giant.